The craggy island of Chios - Χίος (Sakız in Turkish; the Mastic island) lies in the eastern Aegean, only 3 nm off the Çeşme Peninsula, the south side of the Gulf of İzmir; the Turkish Ionian coast. The island is geographically separated from Asia Minor by the Chios Strait and officially belongs to the Southern Sporades or Eastern Sporades. Most of the island is occupied by a range of rugged limestone hills running from north to south, reaching their highest point in mount Profitis Ilias (the ancient mount Pellinaon; 1297 metres) and forming impressive cliffs, particularly on the east coast as they fall steeply down into the sea. The 51 thousand inhabitants are concentrated mainly in the fertile southern part of the island, where olives, vines, figs and citrus fruits are grown, in addition to the famous mastic tree or lentisk, Pistacia Lentiscus, the source of the island's major product: the mastic gum which was already being exported in ancient times and contributed - as it still does - to the prosperity of Chios. The aromatic resin is also used to produce mastikha, a sweetish liqueur, and confections of rather cloying sweetness. Commerce and shipping also make important contributions to the economy of the island; roughly a third of the Greek commercial shipping fleet is based on Chios. West of Chios, off Elata Bay - Ελάτα are the little islets of Pelagonisos (Pelagonissi), Ayios Georgios (Ayios Yeoryios) and Ayios Stefanos, with the remains of Hellenistic watch-towers. Must-sees on Chios self are the small town of Pyrgi - Πυργί that is dominated by a Genoese castle 30 km south of Chios town; 5 km further south-west is the archaeological site of Kato Fana with remains of a Temple of Apollo. Near Langada - Λαγκάδα are the excavated remains of Delphinion, a strong point established by the Athenians in 412 BCE. Marmaro further north offers a sandy beach. Ay. Ermioni on the east coast is now the main tourist centre, with an abundance of ugly hotels. The base nearest to Chios for yacht charters is Samos island. The earliest archaeological evidence goes back to the 4th millennium BCE. In the 8th century BCE Ionian Greeks settled on Chios and made it one of the wealthiest and most powerful members of the Panionic League, which was established about 700 BCE. In the 6th century BCE an important school of sculptors was active on Chios. From 512 to 479 BCE the island was under Persian rule, It then joined the first Attic maritime league but was able to preserve its independence. At this period it was said to have a population of 30000 free men and 100000 slaves, who prospered through the wine trade, commerce and industry (producing beds and couches which were much sought after). In 412 BCE Chios broke away from Athens, and in 392 it severed its alliance with Sparta. In 377 BCE it became a member - for a brief period - of the second Attic maritime league. Under the Romans, with whom it formed an alliance in 190 BCE, it still contrived to maintain its independence. Chios was held by the Venetians from 1204 to 1304 and subsequently by the Genoese. It became Turkish in 1566. The island's mastic and the sweets made from it were so popular in the Sultan's harem that Chios enjoyed a special status; no Greeks, however, were allowed to live in the citadel (kastro). The weaving of silk also contributed to the island's fame and prosperity. Throughout their eventful history the men of Chios were renowned for their skill in seamanship and trade. During the War of Greek Independence Chios was sympathetic to the cause of liberation, and suffered for it when the Turks sent a punitive expedition to the island in 1822 and carried out the bloody massacres depicted in the famous painting by Eugène Delacroix. In 1881 the island was devastated by a violent earthquake. In 1912, during the Balkan War, a Greek squadron captured the island from the Turks after a brief resistance. After the First World War Chios lost its economic hinterland on the mainland of Turkey and thereafter had to give asylum to many Greeks expelled from Asia Minor. The bare rocky island of Psara - Ψαρά, the ancient Psyra (Mycenaean tombs found), lies 10 nm north-west of Chios. The chief place, also called Psara, lies on the south coast, below a medieval castle. To the north-east is the Monastery of the Dormition (Kimisis Theotokou). Now poor and depopulated, the island had a period of considerable prosperity in the 18th century, when the descendants of the Albanians who had settled on the island in the 16th and 17th century made it the third naval power in the Aegean, after Hydra and Spetses (Spetsai). The island's dilapidated old mansions and the stumps of windmills on the hills bear witness to this period, when Psara had a population of some 20000. Then, in a reprisal for the islander's stubborn resistance to the Turks, a Turkish force landed on the island and slaughtered the inhabitants. After Psara became part of the new kingdom of Greece in the 19th century it was resettled from Chios. The 422 inhabitants live by farming and seafaring. South-west of Psara is the smaller islet of Antipsara - Αντίψαρα. To the east of the island of Chios, at the north end of the Chios strait, are the Oinousses - Οινούσσες (Inousai) islands (formerly known as the Spalmatori islands). The principal island is Oinousses (nautical school), the east of which are the islands of Pasas, Gavathion and Vaton, all fringed with reefs and isolated rocks but with several excellent anchorages. The island's capital and principal port, Chios (pop. 33000), occupies approximately the same site as the ancient city. Its houses extend in a semicircle round the harbour bay, which is dominated on the north by the ruined Kastro or citadel (13th-16th century), but there are plans to renovate the citadel. Of the old town little remains; the few houses that survived the Turkish punitive expedition of 1822 were destroyed in the 1881 earthquake. Must-sees are the Archaeological Museum, the mansion of the Argentis family and the Korais Library! 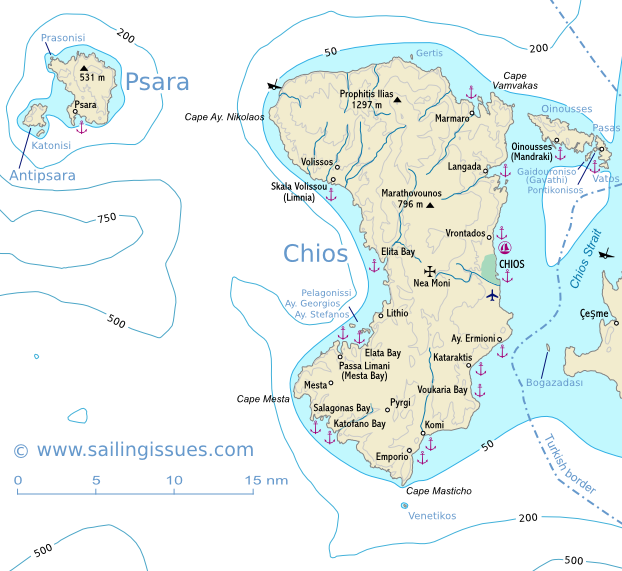 Note, that the Chios marina, which lies 1 nm north of Chios town, is of the usual unfinished type. From Chios town a road runs north-west, through the colourful village of Karyes and over a pass, to the Convent of Nea Moni, a straggling complex of buildings in a verdant setting now listed a UNESCO World Heritage Site.